I just bought a Sony DVD player. And I was actually stumped on how to use the remote control. It's just a DVD player. Why are the remote control so complicated? Contrast to the Apple TV. This two-cigarette-box size wonder can play YouTube, Vimeo, Hulu Plus, iTunes Music, buy songs, movies, TV and subscribe to pod cast. It can even view all the photos in My Photo Stream (taken with the iPhone and sync in real time) and play Apple Trailers. 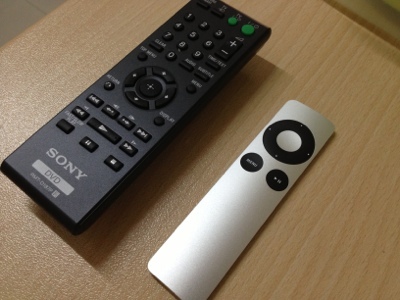 And the remote is 10 times thinner and with just a few buttons. If Sony or other consumer electronics are still not learning, it's just a matter of time before the fade into nothingness.